Here’s another nifty cycling tool that’s starting to pop up more around Christchurch: hook turn boxes. These innocuous little painted boxes at intersections help people cycling make that trickiest of manoeuvres – the right-hand turn. So what’s a hook turn? Basically it’s a right turn done in two steps. 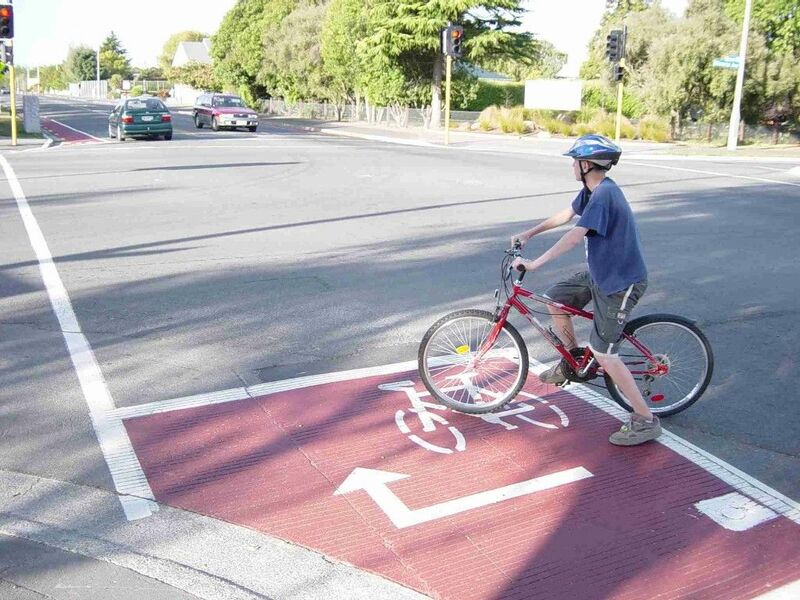 As explained in the NZ Cycling Code and shown in the photo below, step 1 is to ride across the intersection, turn your bike around, and wait in the little box (usually marked with a cycle symbol and right-turn arrow). Then, when the traffic signals change for the side-road traffic, step 2 is to ride across to your intended departure leg with the crossing traffic. The beauty of hook turn boxes is that they allow riders to avoid the somewhat grotty manoeuvres of getting across to the right-turn lane in the middle of the road and then trying to find a gap in the opposing traffic. This is particularly a problem on busy multi-lane roads. Hook turn boxes have actually been around in Christchurch for over a decade now. The very first one (and indeed, the first in the country) was trialled in 2002 opposite Burnside High to help school kids get across Memorial Ave more easily. Since then they have only slowly been installed until recently (in fact I’m still not aware of any in NZ outside of Christchurch). Hook turns are a very common cycling tool in some other countries. 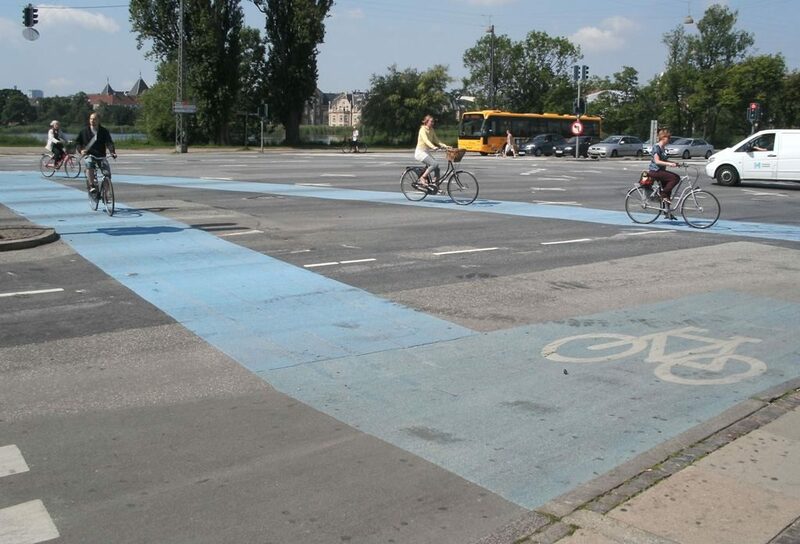 When I was in Copenhagen, for example, I noticed quite a few hook turn boxes marked around the city (for left-hand turns in that case). But interestingly, even when there wasn’t a formal box, most people cycling there tended to undertake a hook turn to turn left. Perhaps that reflected a much greater proportion of less-confident “interested but concerned” riders there? 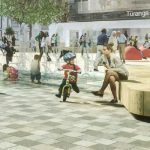 There are a few popping up around the city now, including Lincoln Rd (Whiteleigh/Barrington and Lyttelton/Wrights intersections) and new ones proposed for the Frankleigh/Sparks/Lyttelton intersection in Spreydon and the Brougham/Strickland/Antigua intersection in Addington. NZTA actually installed a whole series of them a number of years ago along Brougham St. However, not that you could tell – not one of them was marked completely properly with coloured surfacing, arrows and symbols. And so even today most people think they’re just there for an advanced stop space. Of course, you don’t actually need a hook turn box to undertake a hook turn. It’s perfectly legal to do a two-step right-turn manoeuvre at any intersection where you don’t feel comfortable doing the alternative (e.g. where the middle lane is a combined through/right lane, leaving nowhere safe to wait). Just make sure you stop clear of other through traffic (including bikes and crossing pedestrians!) and also ensure that you’re not blocking left-turning side-road traffic if they get a special signal phase first. What do you think of hook turn boxes? Where would you like to see some installed? Hook turn? Cool, now I know the real name of this manouvre – I do it quite a lot on busy roads! Takes longer (i.e. have to wait for two sets of lights) but feels a lot safer. I’ve started using the one to turn right from Lincoln into Wrights Rd and find it really handy. I don’t think it does take much longer though Frances: You’re doing the second manoeuvre at the very start of the second light phase, instead of turning from the middle of the road at, more often than not, the very end of the first light phase doing the “regular” less safe way. So just a few seconds longer and a really noticable risk reduction. This is definitely something I’d encourage my kids to do if they’re turning at traffic lights, even when the road isn’t multi-lane. These work great for multi-lane road. I used these extensively cycling overseas, it is great to see these finally made it here. Hi Folk, great to see you doing some education on hook turns. Unfortunatly the First example “Green Hook Turn Box” located at the Barrington Street/ Lincoln Road intersection in Christchurch has been installed in the wrong position. The Signals D phase of this intersection has an exclusive left turn arrow prior to the straight through green. So as presently marked the cyclist waiting in the hook turn box will be blocking the left turners on on a green arrow. The contractor has been given instructions to correct this ASAP. Untill then Cyclists completing a hook turn should wait in front of the lincoln Road cycle lane. Thanks Steve. However I’m a little confused, as my observations of the phasing there are that the left-turners from Lincoln Sth get a green arrow (with the Whiteleigh traffic) BEFORE the traffic from Barrington (heading for the hook turn) gets to go. So in practice there shouldn’t be any conflict. I do a hook turn, heading south on Main South rd Hornby intersection with Carmen Rd (heading North). I have found it a very safe maneuver, and even the drivers seem happy with it, after initial surprise. In Melbourne many busy roads have no space for right turning vehicles to wait. On these roads, there are hook turn boxes for cars. There is enough space for two cars to wait in front of the other traffic. Seems to work a trick once you know the system. For bikes, hook turns are fantastic at busy intersections. Like Simon says, it barely adds any time because at busy intersections you most often end up making your right turn during the orange phase of the light. Having to wait for the green in the perpendicular direction will add only 3 or 4 seconds to your journey. Legally if you stop to do a hook turn do you have to wait for the lights to change before continuing? Or can you go immediately? I’m asking because often there’s say 3 or 4 cars following which prevent cyclist moving into road centre to turn right but during the time it takes for the cyclist to stop for hook turn cars have all passed and way is clear. 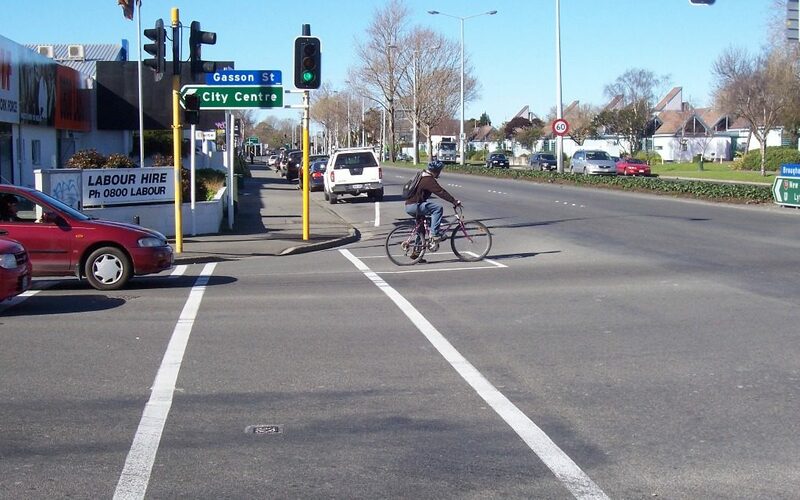 Yes, if it is a signal-controlled intersection then you do have to wait until the side road lights go green – Road User Rule details here: http://www.legislation.govt.nz/regulation/public/2004/0427/40.0/DLM2510800.html. Note that you can also do a hook turn at an unsignalised intersection, and then it’s just a case of waiting for a gap in traffic. Bugger. So being 100% legal it’s actually faster to slow down part way along the block and time it so that can then turn right behind the cars rather than use the hook turn box. Seems counter intuitive, particularly as by slowing down could be holding up other cyclists who are wanting to go straight ahead. I sometimes find that you can’t turn right on a busy road until the very end of the phase when the lights change (and if there’s a queue of turning traffic I might have to wait through a few light cycles before it’s my turn to go right). So you might not have to wait much longer by using a hook turn; could be literally seconds later when the lights change, or sometimes it’s even quicker.